Lord Fairfax Community College (LFCC) evaluates success with respect to student achievement consistent with the College’s mission. The College employs a variety of criteria, collects information on how students perform based upon those criteria, and shares student achievement information with students, faculty, staff, the College Board, and other external stakeholders. The College uses multiple measures that indicate student achievement. The following narrative presents some of the College’s achievement measures, how those measures relate to the College’s mission, the performance criteria or goal used by the College to define success, longitudinal student performance data, and evaluation of the extent to which students are successful. The primary criteria for LFCC’s success in student achievement is scoring at or above the Virginia Community College System (VCCS) average and/or median, whichever is available. VCCS and statewide peer comparison data are used wherever possible for these measures. Overall, the College’s target is to meet or exceed the most recent VCCS/state score. In fall 2015, LFCC served 7,002 unduplicated headcount students and in annual year 2015-16 it served 9,236 unduplicated headcount students. Enrollment trends are monitored to ensure access as well as service to underserved populations. Enrollment goals are set as part of the College’s five-year, strategic plan, Complete 2021, which is updated annually with new goals and progress reports. Of the 9,236 credit students in annual year 2015-16, 1,461 were under-served, and from economically disadvantaged areas, 1,773 in terms of race/ethnicity, 2,231 in terms of first- generation college students, and 1,882 low income. Eight jurisdictions are served by LFCC, and the participation rate of residents attending the college is documented by the VCCS and LFCC using Census data. There are approximately 307,005 residents in the predominantly rural LFCC region, according to Census data for 2015. Of these, there were 6,207 residents enrolled at LFCC in fall 2015, for a participation rate of 2.04%. The VCCS average is 1.78%. Students from a number of high schools in the region attend LFCC upon graduation. The VCCS average is 22% of graduates attending their regional community college and LFCC’s rate is slightly above at 24%. Retention rates are documented in various ways to track student achievement. These begin with Integrated Postsecondary Education Data System (IPEDS) fall-to-fall retention rates for full- and part-time, degree/certificate-seeking students. The fall 2015 full-time retention rate is 67%, the third highest rate in the VCCS. The part-time rate for fall 2015 is 45%, the second highest in the VCCS. This is noticeably higher than the 34% rate 10 years ago in fall 2005. According to IPEDS data, LFCC’s full-time retention rates are noticeably above the national average for all two-year, public institutions. For fall 2014, LFCC’s rate is 67%, compared to 59% nationally; while fall 2013 is 70%, compared to 59% nationally, and fall 2012 is 65%, compared to 57% nationally. IPEDS part-time retention rates are higher than or equal to the national average for the past three years. Fall 2014 is 46% at LFCC, compared to 43% nationally; fall 2013 is 42%, compared to 42% nationally; and fall 2012 is 47%, compared to 42% nationally. Using the other 22 VCCS institutions as the comparison group for the fall 2015 IPEDS Data Feedback Report, LFCC’s full-time retention rate for the fall 2014 cohort is 67%, compared to 61% for the VCCS. The part-time retention rate is 46%, compared to 40% for the VCCS. Fall to fall and fall to spring retention rates are reported by the VCCS for comparison with LFCC data. For fall 2014 to fall 2015, the LFCC retention rate for all enrolled students is 44.7%, while VCCS’s is 41.9%. More meaningful are the data on all first-time, curricular-placed (degree/certificate-seeking) students. This rate is 52.5% for LFCC, approximately the same as the VCCS rate of 52.9%. For fall 2015 to spring 2016, the LFCC retention rate for all students is 71.9%, while VCCS’s is 69.5%. The fall-to-spring rate for first-time, curricular-placed students is 77.2% for LFCC and 77.9% for the VCCS. As these figures indicate, LFCC’s rates are at or above the average for the system as a whole. Using the other 22 VCCS institutions as the comparison group for the fall 2015 IPEDS Data Feedback Report, LFCC’s overall graduation rate for the fall 2011 cohort is 35%, compared to 25% for the VCCS. According to IPEDS data for all two-year, public institutions, LFCC’s graduation rates are noticeably above the national average. For 2014, LFCC’s rate is 35%, compared to 26% nationally; while 2013 is 33%, compared to 26% nationally, and 2012 is 25%, compared to 26% nationally. Note that in the IPEDS Graduation Rate Survey (GRS) for 2015-16 the full-time, first-time graduation rate within 150% of time is 40%, five percent higher than the previous year. LFCC participated in the National Community College Benchmarking Project (NCCBP) in 2011 and data from the 2007 IPEDS GRS Cohort are compared. Data on post-secondary Perkins performance measures are collected by the VCCS for reporting to this federal program and these are used by VCCS for comparing student achievement. Cohort tracking of student success is conducted to determine retention, graduation, transfer, and overall student success rates. These are broken down based on program length and award for the AA&S, AAS, Certificate, and Career Studies Certificate level. These achievement rates are reported in the following four tables, broken out for each of the two campuses. Course success rates have been examined for all courses annually, as well as for online versus traditional classroom delivery, looking at patterns and ways to improve instruction. Course success is defined as the student receiving an A, B, or C grade; or if the course is pass/fail, a pass or satisfactory grade. In 2015-16, the overall course success rate was 80.0% and the withdrawal rate was 5.0%. The success rate for traditional classroom delivery was 83.6%, with a withdrawal rate of 3.8%; while the online delivery rate was 73.9% with a withdrawal rate of 7.1%. Note that data on students and graduates from all delivery modes, both campuses, and other locations are included in these reports if they are degree-/certificate-seeking students. Annual College Readiness Reports have been prepared each year since 2009 and include a number of tables with key performance indicators of institutional effectiveness. Among entering high school students who needed remediation in fall 2015 to be college ready, 69% earned a satisfactory grade in developmental English, up from 59% from fall 2011. Most of the Annual College Readiness Reports allow for comparison to the VCCS average. For example, in terms of college readiness in math, 51% of regional high school students entering LFCC are ready, compared to 49% statewide for the VCCS. In addition, college readiness reports provide data on first semester GPA ranges. Approximately 21% earned a 3.5 to 4.0 GPA, and 38% earned a 2.5 to 3.4 GPA in fall 2015, percentages that are comparable to and several points above the VCCS average. Course success by subject is also analyzed. Given the large number of disciplines, data are reported at the macro level for the nine LFCC jurisdiction school divisions. Course success rates are available for all subjects, but the focus is on those with the most enrollments, including biology, English, history, information technology, math, and total. The report is prepared each year for the current fall semester and for the previous five-year period. Overall, 71% of high school graduates were successful in their courses in their first fall semester between 2011 and 2015. This compares to 70% for the VCCS. The withdrawal rate of 6% is lower than the VCCS total of 7% for this time period. Another LFCC College report provides the course success rate for dual enrollment (DE) courses in fall 2015 and spring 2016 compared to the same courses in a non-DE setting. The results suggest that DE students do as well, if not better, in terms of course success than non-DE students attending on campus. Approximately 96.7% of DE students were successful in their courses, compared to 78.5% for non-DE. A variety of other course success reports are prepared by the College, focusing on different subjects, delivery modes, instructor types, and specific courses of interest. An example is course success rates by school division and high school for 2015-16. In terms of preparation for transfer, a five-year summary of college transfer awards suggests that LFCC is significantly increasing its number of awards, from 837 in 2011-12 to 1,003 in 2015-16. This was due in part to the addition of the general education certificate award. A report on LFCC awards since 1971-72 documents that the number of career technical awards went from 156 in 2011-12 to 177 in 2015-16 and the number of certificates went from 280 to 356 for those years. The total number of graduates in 2015-16 (1,239) and the total number of awards (1,536) is the highest ever. The highest number of AA&S degrees (529), AAS degrees (177), AS degrees (406), certificates (596), and career studies certificates (194) were all awarded in 2015-16. Trends in demographics by award level are also analyzed by the College. Transfer plans are reported in the LFCC Graduating Student Survey which is administered each year. For example, the top pick with 19.9% of respondents is James Madison University (JMU). 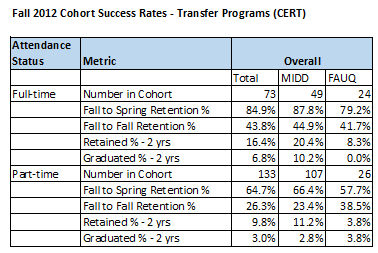 While these self-reported data are only one measure of perceived success, the rate of four-year transfer does correspond with data from the State Council of Higher Education for Virginia (SCHEV) about transfer trends through 2013. When the SCHEV data were no longer available, data are used from the National Student Clearinghouse to look at transfers by college and program from 2013-16. 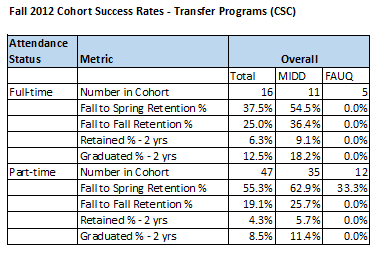 National Community College Benchmarking Project (NCCBP) 2011 data on student completion and transfer for the 2007 IPEDS GRS Cohort are compared. The results suggest that LFCC’s transfer rates are in line with the nation’s community colleges. The combined student success, three-year rate for completion/transfer for full-time students of 43.5% is ranked 68% among NCCBP schools. The part-time rate of 24.1% is ranked at the 73rd percentile. According to the IPEDS Data Feedback Report for 2015, the transfer rate for LFCC of 8% is less than the 12% for the VCCS. The most recent submission to the IPEDS Graduation Rate Survey (GRS) for 2015-16 shows that LFCC’s transfer rate is now 10%. This lower rate is a result of success with the College’s higher percentage of completers. The VCCS report entitled “2005-06 VCCS Graduates’ Outcomes at Transfer Institutions by 2012” shows that 46% of graduates transfer to a four-year institution, compared to 44% for the VCCS, between 2005-06 and 2012. These data are taken from a VCCS Student Success Snapshot report. Approximately 33% of LFCC graduates earned a bachelor’s degree from four-year institutions, the same rate as the VCCS. 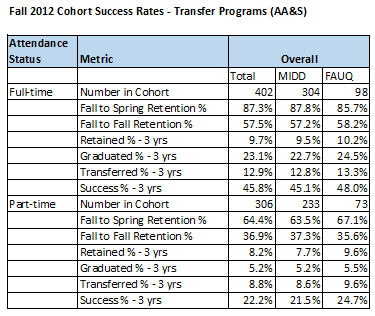 As discussed above, cohort student success rates are calculated for the college overall and by program. 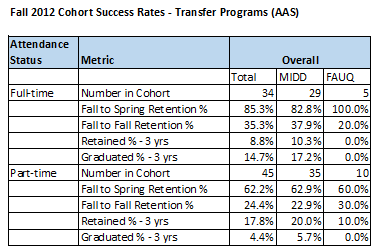 When looking at transfer student achievement in terms of the AA&S transfer programs, these are relevant when looking at the percentage of students who graduated and/or transferred. National Student Clearinghouse data are used and broken out in the following table for fall 2012 cohorts of new, first-time, full-time and part-time students. These data are also reported by campus, based on the primary campus of the student at the semester of first enrollment at LFCC. Results for several programs are presented in the table below. These show some variation by campus, with the Fauquier campus appearing to be higher in some rates. Additional transfer analyses have been done with another source of data – Virginia’s Guideline Eight data, which previously required four-year institutions to report back to two-year institutions on how their students perform after transfer. There has been great interest in how LFCC students perform once they leave the college and take classes at four-year colleges, particularly James Madison University (JMU). The College examined course success by LFCC students in JMU classes by subject and the results suggest that 84.5% of students were successful in their four-year coursework. Longitudinal data from 2002 to 2010 about LFCC transfers to JMU suggest that students are successful in their courses with a range over time from 74.0% to 95.0%. The Career Readiness Certificate (CRC) is another path to employment outcomes monitored by LFCC and the VCCS. The number of CRCs at LFCC has ranged from 118 in FY 2013 to 83 in FY 2016, up from a low of 43 in FY2014. Data on post-secondary Perkins performance measures and other data are used to ensure that career and technical education (CTE) programs are successful. The Perkins measures focus on success in CTE courses, completion, retention/transfer, employment, nontraditional participation, and nontraditional completion. The most recent Perkins data report by LFCC for 2014-15 about LFCC students show 79.7% attaining technical skills; 54.4% with completion; 63.4% retained/enrolled after one year; and 79.1% employed. All of these are above the state performance target at the 90% threshold for Perkins. For the last two indicators about non-traditional participation, participation is approximately 10.9% and completion 8.6%, both lower than the VCCS average. The College has been working to improve its results on these two non-traditional measures. The LFCC Graduating Student Survey examines anticipated employment with the question “Do You Expect to Get a Job Related to Your Field of Study within 6 Months?” The percentage of respondents who report that they will get a job in their field of study was 74% in spring 2016. This is up from data collected for fall 2014 and fall 2015 in which the percentage was 63% and 68% respectively. The VCCS analyzes unemployment insurance wage record data on employment, looking at student achievement at two points in time, within six months and after two years for spring 2010 exiters, providing comparison data for its institutions. The results show that 70% of LFCC exiters are employed in six months, compared to 65% for the VCCS. Approximately 64% are employed at two years, compared to 61% for the system average. In terms of retaining employment, 72% of LFCC exiters are retained in the first year and 58% the second, in contrast to 71% and 58% respectively for the VCCS. The median quarterly wage for LFCC exiters in two years is $5,500 compared to $5,400 for the VCCS. The VCCS analyzes system-wide data and provides comparison reports, such as “Annual Enrollments and Graduates, and Six Month Employment Rates for Graduates for Students in Health-Related Programs.” The LFCC employment rates in health-related fields were 85% in 2008-09 and 76% in 2009-10, comparable to the VCCS average of 75% and 79% respectively. The State Council of Higher Education for Virginia (SCHEV) works with K-12, workforce, and other segments of state government to support the Virginia Longitudinal Data System (VLDS). Reports from the VLDS address the employment of graduates in terms of rates and wages and are available by CIP Code for college programs where there are sufficient numbers of graduates. The data are averaged across five years to protect confidentiality. The LFCC results suggest that graduates are successful in gaining employment. Graduates of the LFCC nursing program earn an average of $47,863 eighteen months after completion. Only 12% are unemployed, not enrolled in further post-secondary education, or for which there are no data available. Note that self-employed workers and those employed in the federal government and in the military are not captured in these wage records. These data compare to the statewide average for associate degree for registered nursing of $47,005 and 13% unemployed or not enrolled. LFCC associate degree recipients in the CIP Codes for bachelor’s credit earn an average of $24,791, and career studies certificate graduates of less than one academic year earn $31,387. These data compare to the statewide average for associate degrees with bachelor’s credit of $29,473, and career studies certificates of less than one year of $31,635, with LFCC lower and higher on these benchmarks. College Measures, a joint venture of the American Institutes for Research and Matrix Knowledge Group, analyzed employment data provided by SCHEV and other SHEEO offices across the nation and prepared a comparison report on Virginia colleges. The results show that graduates from LFCC earn $12,000 more than those in the same program from some other VCCS schools. Perhaps the most interesting conclusion from this report is that community college graduates from career and technical programs at LFCC and the VCCS out-earn bachelor degree graduates in liberal arts. Other reports are available for comparing wages, with the most available College Measures report from 2013. These chart, for example, Administrative Assistant and Secretarial Science completers over time with wages after the first, fifth, and eight year of employment. LFCC’s eighth year wage average of $27,333 is above the statewide average in this field of $23,479. In some LFCC programs, graduates are prepared to pass national licensure and certification exams. At LFCC, most of these programs are in the healthcare field, including nursing, emergency medical services, and dental hygiene. The AAS in Nursing uses the NCLEX-RN pass rate, with scores broken out for the Middletown and Fauquier campuses. The Middletown pass rate for 2015 is 98.0% (51 candidates) and Fauquier is 100.0% (14 candidates). Over the past five years, Middletown’s pass rate has ranged from 87.0% to 98.0%. Fauquier’s pass rate has ranged from 89.4% to 100.0%. The Certificate in Practical Nursing uses the NCLEX-PN pass rate, with scores broken out for the Middletown and Fauquier campuses. The PN pass rates show 100.0% (11 candidates) for Middletown in 2015, no test takes for Fauquier that year. Over five years, Middletown’s pass rate has remained at 100.0% for the past four years, with between 14 and 24 candidates passing each year. Fauquier’s pass rate has also remained at 100.0% for the four years of recent data. The Career Studies Certificates in EMS Advanced and EMS Intermediate prepare graduates for two exams of the National Registry of Emergency Medical Technicians (NREMT). Four quarters of data are documented for the EMT Intermediate exam. Data are provided on first pass rates and cumulative pass rates within three and six attempts. The first pass rate ranges from a low of 89% for one quarter to 100% for three quarters. The cumulative pass rate after three attempts is 100% for all four of the most recent quarters. Four most recent quarters of data are documented for the EMT Paramedic exam. Data are provided on first pass rates and cumulative pass rates within three and six attempts. The first pass rate ranges from a low of 63% to a high of 86%. The cumulative pass rate after three attempts ranges from 83% to 100% and the rate after six attempts is the same: 83% to 100%. The dental hygiene associate degree program is offered in a two-year cycle through a joint venture agreement with Virginia Western Community College (VWCC), which confers the degree. LFCC students participate in classroom instruction using distance education technology. LFCC provides clinical instruction and supervision. VWCC provides licensure data with pass rates for first-time test takers of the National Board Dental Hygiene Examination (NBDH). For LFCC students, the overall VWCC NBDHE pass rates from the Commission on Dental Accreditation were 96% in 2014 and 97% in 2016. Fifteen LFCC students graduated from this program in 2014, 17 in 2016. For their clinical boards, the 2014 and 2016 LFCC cohorts achieved pass rates of 98% and 97% respectively.